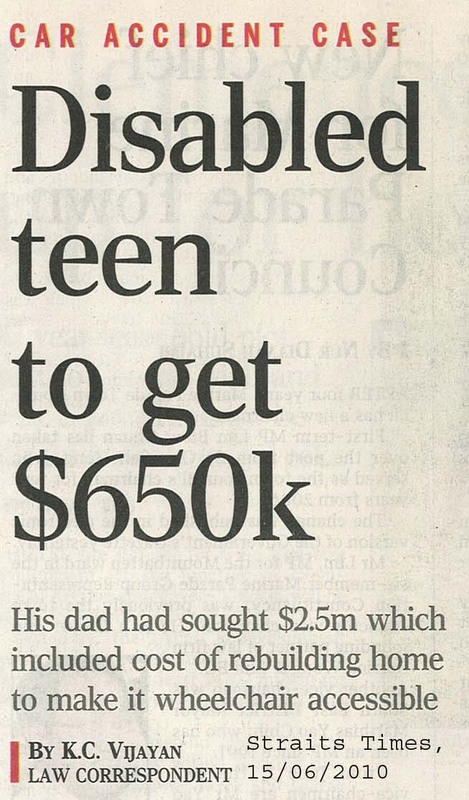 The father of a victim who was knocked by a car & got paralysis had asked for $2.5 million in compensation but only to be awarded $650k by the court. What is your first thought when you read such news? The responses I got range from the negative ‘money grabber’ to empathic ‘tragic’ to the positive ‘at least got some money to tie over’. What is clear is that each individual has the same view of this accident that is “it’s a tragic” but its not so clear when asked to put a monetary value to someone’s life. It is common that whenever some financial advisors suggest a $500k or $1mil of coverage for an individual, the prospect thinks that advisor is crazy or that advisor is trying to get a fat cheque off him. In the financial planning process, the advisor should be able to your needs. The needs varies from an individual to another individual and it may signal a lack of knowledge when the advisor suggest 5-10yrs of annual income. In the case of the reported accident, we may look from the point of Income Protection. and the amount easily cross $1million if you put in those factors. A detail plan should be done in a proper planning. While there is no way to put a value to someone’s life, we can put an economic value to him. One of my client told me his advisor only ask him to buy insurance and say there is not so much need for his wife who stays at home and look after the kid. I told him that he will be surprised to know the economic value of his wife. Next, the wife fetches the kids to & fro school & a part time chauffer to pick them up will cost at least $800/mth. To have a tutor to teach the kids if the wife is gone is going to cost another $500/mth. The list goes on & on but these 3 cost will add up to almost $2,000/mth! His child was only 6yrs old and we can assuming he can work in MacDonalds if he is 16. Even with that assumption, he jolly well prepared $240,000 sitting in the bank to fund for these expenses if the wife dies before him. Another option is he can use less than $1,000/yr to get an affordable term to cover this liabilities. The question is never how much one should be insured but who do you want to insure you? The choice is by an insurance company or your own insurance company thru self-insuring. Previous What’s your game plan?